On the pile of albums to do for some time was Marlowe's Revenge and it is about time to finalise my view of this fantastic rock album and give it the credits due. Dan Stuart was of course the lead singer in Green On Red, along side that other veteran of Paisley Park, Chuck Prophet of whom I have many records in my collection and who I saw play live several times in Leiden. Dan Stuart, as Green On Red, remained a mystery to me. Until now that is. Marlowe's Revenge sets off with a bang. 'Hola Guapa' is a punkrocker of mega proportion. Stuart spits his lyrics into a microphone that must have needed a cleaning job afterwards. He sounds angry, totally pissed off actually, at something or someone. The band obliges at full force. A pumping bass, a Hammond organ, hard-hitting drums and the guitar riffing away. 'Hola Guapa' is an opening statement that won't budge for anything, anyone, anywhere, anytime. The guitar solo is a tempest. The noise from the amp must have made hairs wave in the studio. Iggy in his best days would have had a hard time keeping up. The tone is set for Marlowe's Revenge. There can't be a way back and there is no way back really. 'Elena' may be acoustic guitar driven, the snares are attacked, while Dan Stuart is more sneering his admiration than singing to his love. A psycho killer roving for prey, that is a nice description for this song. The pace of Marlowe's Revenge may go down. The intensity and intent do not. 'Last Blue Day' is a ballad of sorts. Dan Stuart is singing softer and shows that his voice is a bit worse for wear, so the more authentic. The drummer does not give up on his task as does the electric guitar that keeps playing the same three notes over and over. The atmosphere on Marlowe's Revenge is near hostile and aggressive. That is exactly what makes 'Soy Un Hombre' such an epic song. The idea may be a declaration of love, "I never met another girl that kept me up at night" (positive/negative reasons? ), the package is, again, hard and harsh, rough, like the hands of a miner or carpenter caressing the one he loves. There's no need to go deeper into the songs that follow the first four. By now you've got the drift or you don't. Dan Stuart is on his own private Iggy Pop trip, with a somewhat rockier and more melodic repertoire. 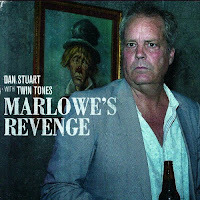 As I wrote I have nothing to compare Marlowe's Revenge to where Dan Stuart is concerned, so let's focus on the story behind the album for a while. The band you hear is Mexican rockers Twin Tones from Mexico City. Stuart moved to Mexico years ago, leaving a non-caring world behind. He showed up in an Oaxaca studio with a bunch of songs and everything started to move from there. The songs, written on an acoustic guitar, were demoed and then built into these rocking beasts. It's 2016 and time the world started caring again. If you thought 'Post Pop Depression' is good, you're in for a surprise. There's no comparison really. Dan Stuart deserves attention for each and every second that is on Marlowe's Revenge. This album is a joy to listen to.